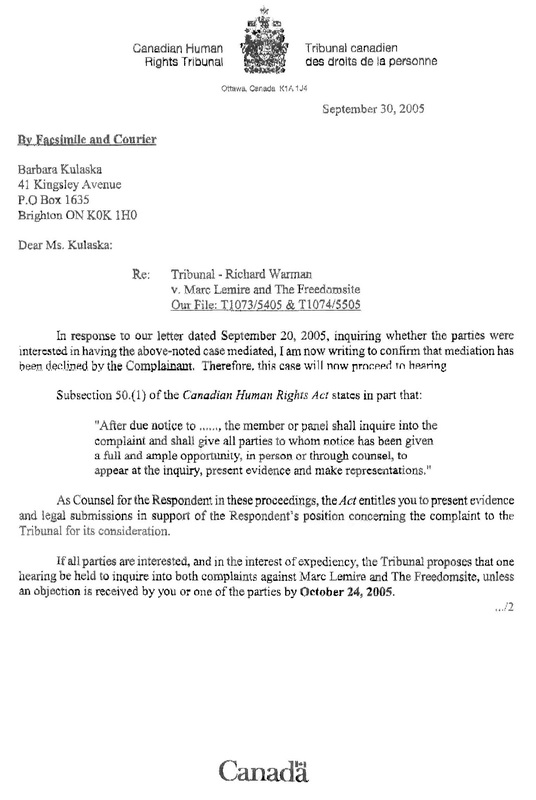 But who is correct, the Federal Court who reviewed the matter [in a ONE DAY hearing], or the Canadian Human Rights Tribunal who reviewed the Lemire case for close to four years, across close to 30 days of evidence and hearings? 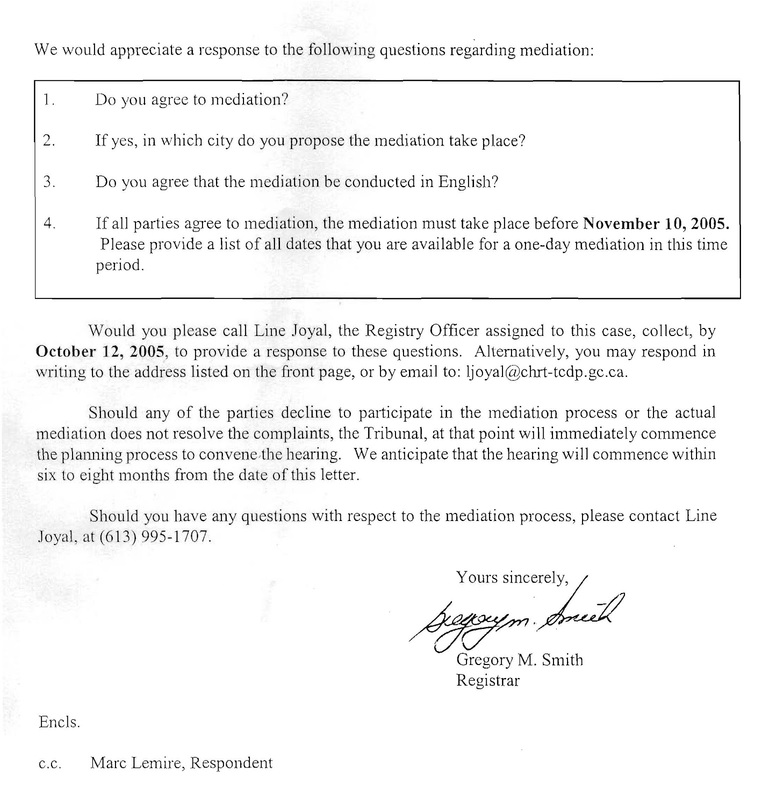 Here is just one of the many documents I have on the mediation issue. I have plenty more, but these documents really underline how the entire process worked against me. It was a punitive process which in itself was the real punishment of the entire hearing. Unlike the questionable ruling by the Federal Court, or any other claims, there was NO “precondition” of anything. 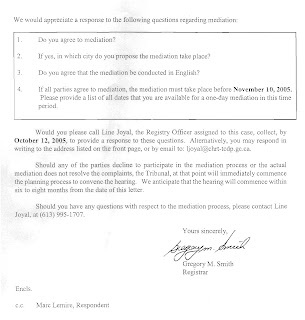 Marc Lemire agreed to mediation before the Canadian Human Rights Tribunal, immediately and unreserved. 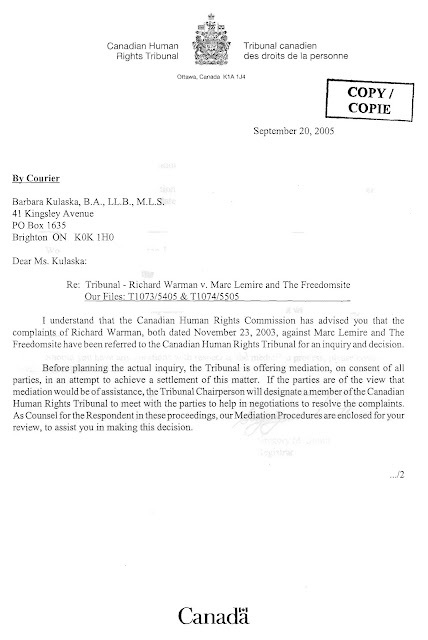 The quote above is the entire letter from Marc Lemire’s courageous lawyer, Barbara Kulaszaka. There was no precondition, or any refusal to accept a “cease and desist” order. And who turned down the mediation before the Canadian Human Rights Tribunal? The Federal Court was totally wrong. 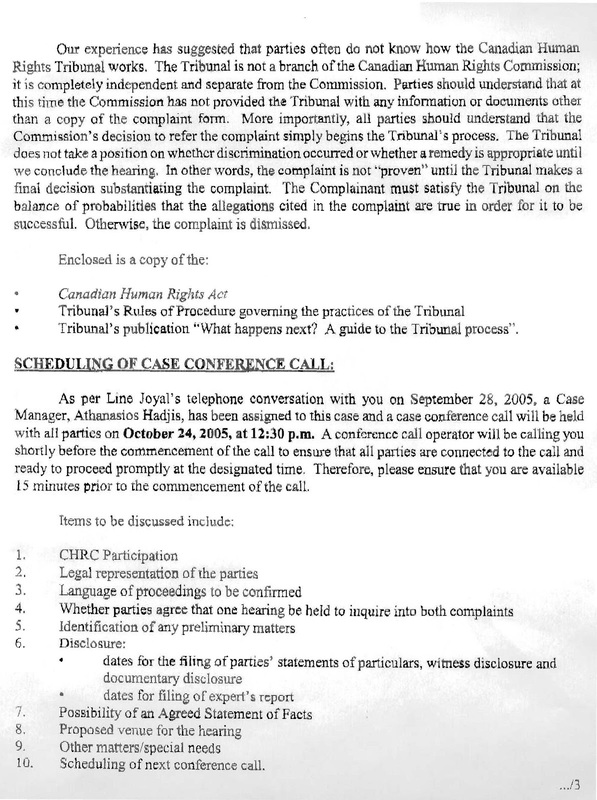 I did not put preconditions on the mediation, and for those that wish to praise the Federal Court for this incorrect ruling, should really review the documents posted in this email, and think again about who turned down mediation from day one. Can you say … “Maximum Disruption”? Can I count on you to support the cause of freedom and rid Canada of this disgusting thought control legislation? My courageous lawyer Barbara Kulaszka and I have demonstrated what two dedicated freedom fighters can accomplish against overwhelming odds. We have single-handedly and doggedly fought the system and exposed the corrupt underbelly of the "Human Rights" Commission's racket. Nothing ever comes easy when you are fighting such fanatical censors. This case is a seminal one, where the outcome will have serious implications on our right to think and speak freely in this country for generations to come. All Canadians will benefit when we manage to get this shameful law expunged from our legal books. I cannot carry on this important fight alone. Your donations literally equal the survival of this case. No organizations are assisting with the bill at all. Richard Warman asked for a penalty against Lemire at the Tribunal – And the Federal Court stuck down the entire penalty provision! Warman 0 – Lemire 1. 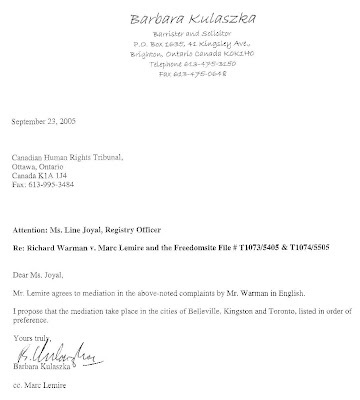 At the closing arguments in the Canadian Human Rights Tribunal hearing into the Section 13 complaint by serial plaintiff Richard “Lucy” Warman against Marc Lemire, Warman asked the Tribunal to assess a penalty against Lemire of $7,500. This weeks ruling by the Federal Court of Canada stuck down the penalty provisions of the Canadian Human Rights Act and strips the power from the Tribunal to fine and penalize censorship victims. The penalty provisions of the Canadian Human Rights Act [s. 54(1)(c)] have been used to heavily fine and punish victims of censorship. The penalties have been used as method to silence those that dare to voice their opinions on the internet. Failure to pay the fines could be seen as contempt of a “human rights” order, which could land the person in jail for up to 5 years. From 2003 to 2008 close to $60,000 was awarded in fines by the Tribunal. From the very beginning of the hearing, Marc Lemire - through his courageous lawyer Barbara Kulaszka – has submitted that the penalty provisions are unconscionable and an affront to our legal system. Both the Canadian Human Rights Commission and Richard Warman were demanding a fine be assessed against Lemire. During the final day of the hearing, the CHRC withdrew their request for a fine, but Richard Warman continued his request. 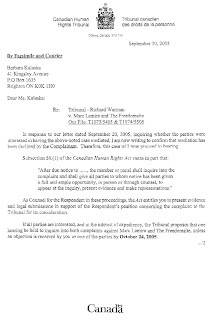 a) An Order that the Respondent and/or anyone acting in concert with him cease the discriminatory practice, pursuant to section 54(1)(a) of the Canadian Human Rights Act. b) An Order that the Respondent pay a penalty pursuant to section 54(1)(c) of the Canadian Human Rights Act. 156. 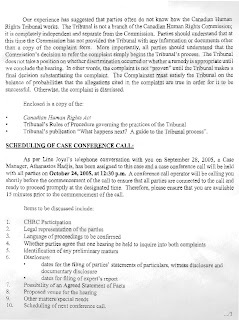 Given that there are three factors militating in favour of the highest possible penalty and no evidence before the Tribunal in mitigation, I submit that a penalty of $7,500, similar to that in the Kyburz case would be appropriate. By the end of the Lemire hearing before the Tribunal, Warman was basically the only one asking for a penalty against Lemire. Here are the submissions of Marc Lemire (via Barbara Kulaszka) on the disgusting penalty provisions of the Canadian Human Rights Act. In Wigglesworth, the Supreme Court held that the rights guaranteed by s. 11 of the Charter were available to persons prosecuted by the state for public offences involving punitive sanctions even if not criminal in the strict sense. Under section 13, the complaint against the respondent need only be proven on the balance of probabilities, thereby violating section 11(d) of the Charter which provides that every person charged with an offence has the right to be presumed innocent until proven guilty according to law in a fair and public hearing by an independent and impartial tribunal. He commented that the purpose of an inquiry under the CHRA is not to measure the moral blame that attaches to a Respondent’s actions. It is to rectify discrimination. The task of imposing a punishment and assessing a pecuniary penalty fell outside the normal ambit of the Tribunal’s responsibilities. It is submitted that the penalty provision has imported into section 13 the moral blameworthiness which the Supreme Court in Taylor consistently referred to as being absent from human rights statutes. However, even apart from the penalty, section 13 is not a remedial provision and is not used as such. Nonetheless, I agree with the Tribunal that the addition of the penalty provision has fundamentally altered the nature of the s 13 process and brought it uncomfortably close to the state’s ultimate control measure, criminal prosecution, with which it was favourably compared by the Court in Taylor. In my view, the penalty is inherently punitive. Like a fine, it goes into the general revenue fund and not towards any compensatory measure such as an education or victim’s fund. In Schnell, at paragraph 163, the Tribunal noted that s 54(1)(c) was designed to express “society’s opprobrium for the discriminator’s conduct.” That view of the purpose of the penalty is enhanced by the factors set out in s. 54(1.1) which are similar to those which a criminal court would consider in determining the fine to be imposed on someone found guilty of an offence. Included is the wilfulness or recklessness of the respondent’s discriminatory practice, his or her prior discriminatory practices and his or her ability to pay. On the penalty provisions; Game, Set, Match for LEMIRE. 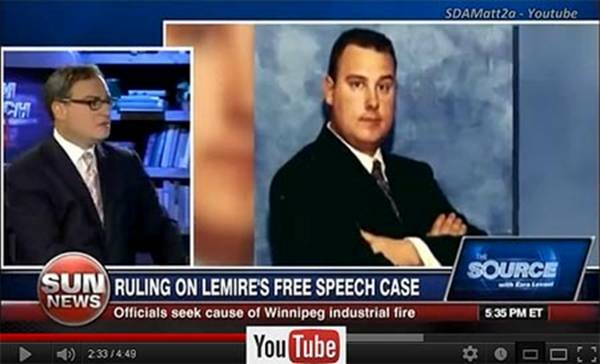 TORONTO Oct 3, 2012: The Federal Court of Canada has issued it’s ruling in the Marc Lemire case, which challenges the infamous censorship provision Section 13 of the Canadian Human Rights Act. The Federal Court has struck down the penalty provisions of Section 13, but held that the doctrine of Severance was applicable and that Section 13 remains constitutional. In yet another head scratching move by the Federal Court, Justice Richard G. Mosley has found that the notorious censorship provision – Section 13 of the Canadian Human Rights Act is constitutional, but that the penalty provisions are unconstitutional. The Federal Court issued their ruling while at the same time; the Senate of Canada is passing Second Reading on Bill C-304 an Act which will strip the censorship powers from the fanatics at the Canadian Human Rights Commission. How out of touch with the will of Canadians can the Federal Court be? This is both a major victory for freedom and a set-back. The Federal Court has found that the penalty provisions of Section 13 are unconstitutional. The Federal Court “declared that ss 54 (1) (c) and 54 (1.1) of the Canadian Human Rights Act are of no force or effect pursuant to s 52 (1) of The Constitution Act, 1982, being schedule B to the Canada Act 1982 (U.K.), 1982, c. 11,1982;”. This strikes down the law which assessed huge fines against victims of Canadian Human Rights Commission censorship. Fines of up to $10,000 were imposed at will against anyone caught up in the “human rights” juggernaut. From the very outset of this thought-control trial (starting in 2003/2004 !!! ); Marc Lemire – though his courageous counsel Barbara Kulaszka – advocated for the penalty provision to be struck down. The CHRC and their fellow travelers fought tooth and nail against this. Finally in 2009, the Canadian Human Rights Tribunal agreed with Lemire, but lacked the power to actually invalidate the law. Today, The Federal Court has struck down the penalty provision and wiped this blight from Canadian Law books. This effectively removes the hammer which the fanatics at the Canadian Human Rights Commission have used to silence and suppress political dissidents from speaking truth-to-power on the Internet. The bad news is that the Federal Court has upheld Section 13. The court found that the Canadian Human Rights Tribunal should have applied the doctrine of Severance, and “read-out” the Penalty provisions and held the underlying provision as constitutionally valid. This is the most shocking part of the decision. Ignoring the very decisive and detailed ruling by the Canadian Human Rights Tribunal, Justice Mosley found that Section 13 was just fine. 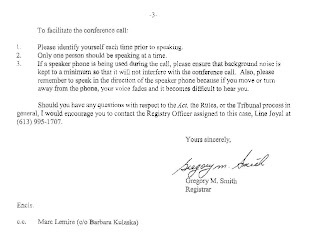 Contrary the mountain of evidence which was submitted during the Lemire Tribunal hearing; Justice Mosley found that there was little difference with Section 13, when it only applied to telephone answering machines to what it applies to now – the entire Internet. In Mosley’s mind, a crappy telephone answering machine is similar in reach and scope as the entire internet is. And as such there is no issue with applying the censorship powers of Section 13 to the entire media, broadcast media, podcasts, interactive content, Twitter, Facebook, YouTube, etc etc etc. After all they are just like an answering machine?!?!? It really makes you wonder what is wrong with our courts and those clowns that elevate themselves to god-like status to rule over us little sheep. 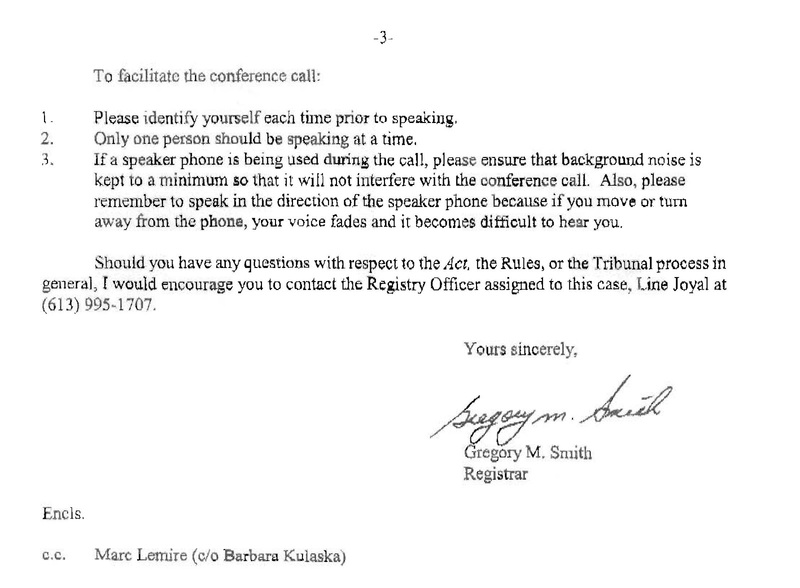 How the heck could the court rule that a telephone answering machine is no different than Facebook, Twitter or YouTube? Unlike our proud ancestors who had to fight for freedom in the trenches of Normandy and in the highlands of Scotland, nowadays we have to fight for freedom in stale court rooms surrounded by out of touch “Justices” and their cadre of useful idiots just waiting to praise anything they do. Every single major news outlet in Canada has denounced the censorship provisions of Section 13 – from coast to coast. From the leftists at the Toronto Star, to the National Post, Toronto Sun, Vancouver Province, Globe and Mail, Macleans Magazine, Calgary Herald, Ottawa Citizen, London Free Press, Catholic Insight, Catholic Register, B'nai Brith Jewish Tribune, Halifax Chronicle Herald, Sask Leader-Post, Winnipeg Free Press, and even the CBC. The Parliament of Canada has voted to repeal Section 13 by a majority of Members of Parliament in the House of Commons. The Senate of Canada has already voted twice to repeal Section 13 and is it now on the way to third and final reading … yet this Justice Richard Mosley – in utter sheer arrogance and in clear contrast to a majority of Canadians – gives Section 13 its last gasp of air. It was pretty clear during the court hearing in 2011, that Justice Mosley was harbouring a great deal of animosity towards the side representing freedom and justice. He treated my lawyer – Barbara Kulaszka – like complete trash. Constantly cutting her off and limiting our time to submissions down to almost nothing. The exchange between Mosley and Kulaszka was even quoted in the National Post the next day. Like a lost soul, Justice Mosley just kept asking why the Attorney General of Canada was not appearing before him to make submissions. Of course the mere fact that the Attorney General was not going to appear in Federal Court to uphold this censorship law spoke volumes to everyone present. It is really quite a statement when the Attorney General of Canada refused to appear in the court to uphold their law. And it was even more evident when days later the Attorney General of Canada – Rob Nicholson – rose in the House of Commons and voted on Bill C-304 an Act to repeal Section 13. Can the message be any clearer Justice Mosley?